This is part of Richard's Industrial Architectural portfolio. The photo above, of Charring Cross in London, earned him the title "International Building Press Photographer of the Year 1992". The photo above right was runner up in the Architectural Photographer of the year (building category) 1992. 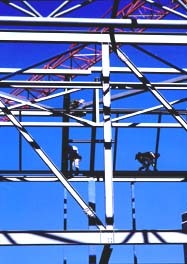 Steel workers constructing the roof for the World Student Games in Sheffield, UK. Construction of the new Birds of Prey Aviary at London Zoo using steel wire strung from ends of the shell. Interior of a gas fired power station. UK.